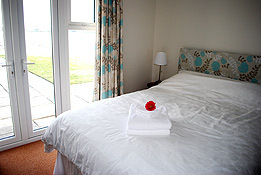 Each cottage sleeps 6 and has been renovated to a high standard. The cottages are single storey and both have a similar layout. The two cottages are adjoining but have separate entrances and gardens as well as parking for two cars. The hallway leads through the property to an open plan kitchen and living area. There are dining table and chairs, comfortable seating for six, large windows providing fantastic views towards the river Tay and patio doors leading to the garden area. The garden area, looking out onto fields with superb views to the River Tay, is a mixture of lawn and patio. A barbeque and outdoor furniture is provided. 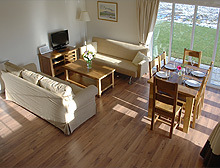 This is a great area for children to play or for you to simply relax and enjoy the view. There is also a garden shed where bicycles can be stored and an outdoor drying area. 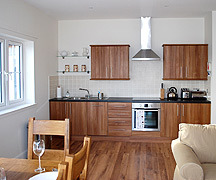 In addition, there is a Digital TV (freeview), DVD player, ipod docking station, fridge, freezer, electric oven and hob, microwave, dishwasher, washer dryer, iron, oil-fired central heating, parking. There is also a bathroom (bath with shower over) and a utility room. Linen and towels are provided. A travel cot and highchair are available on request. Dogs are welcome but please note there will be an additional £20 charged.